The Usage screen shows Content Container assets that are currently using the Content Container Template. For each asset shown, it also displays the dependent parent asset the Content Container asset is part of. By default, if the Content Container Template has not been applied to any assets, no information will appear on the screen. Once the Content Container Template has been applied to an asset, the information shown in the figure below will appear. 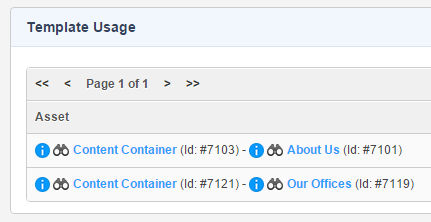 In the above example, the assets listed on the left are the Content Container assets the template is applied to. The assets on the right are the Standard Page assets the Content Containers are a part of.